The exposure to double taxation is a real threat for professional athletes performing services in both the United States and Canada. It is important for these individuals to understand the different taxing philosophies of both countries, their obligation to properly self-report their earnings, and their need to undertake careful tax planning. The U.S. Canada Income Tax Convention provides relief in the form of a foreign income tax credit. However, it does not totally eliminate the incidence of double taxation. 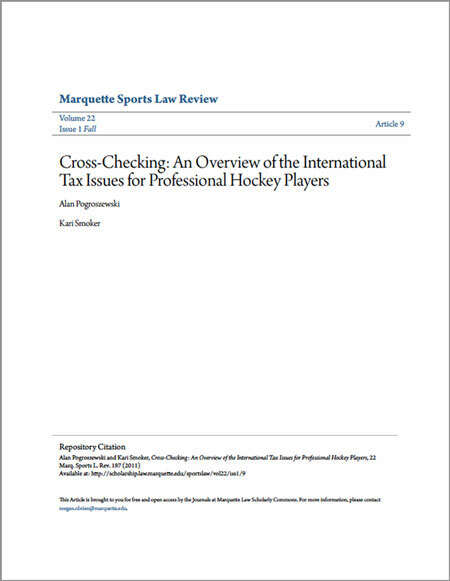 It is important for those who advise international athletes to help their clients understand the appropriate steps they can take to best avoid a heavy tax burden. In reviewing the practical application of international tax exposure between Canada and the United States, there are income tax strategies that can be implemented to significantly alleviate some of that tax burden at both the federal and state levels.